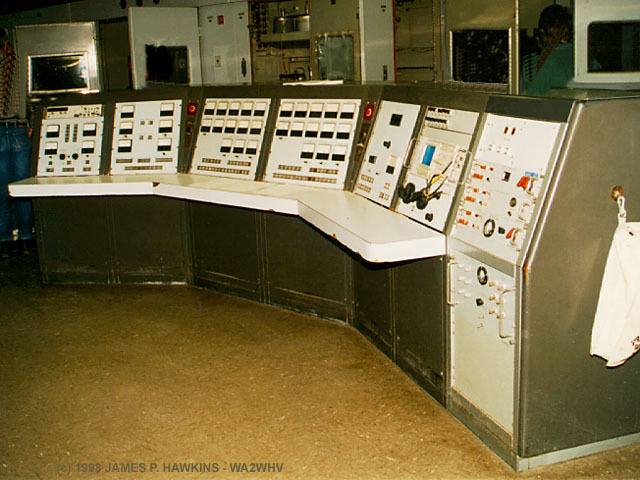 This webpage is a technical discussion and tour of the NSS site an April 18, 1998, which was coordinated by John Cummings, N3CZE, with the transmitter facility staff. 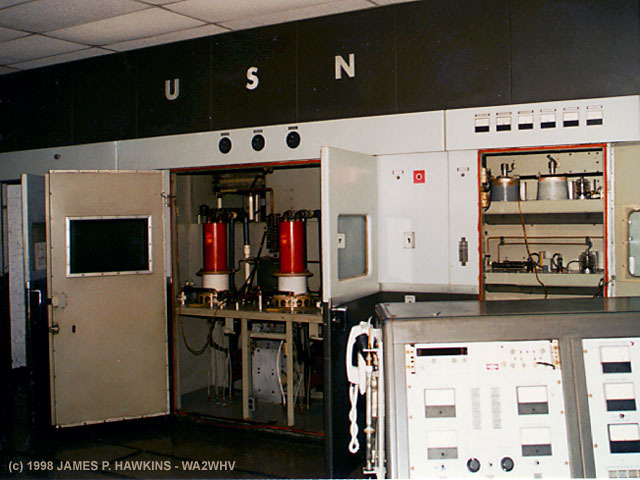 In simple words, NSS was a high powered, Very Low Frequency (VLF) transmitting facility which provided a means of reliable communications for the command, operational control, and administration of the Naval establishment ashore and afloat (and submarines 65' below water surface), as may be directed by the Commanding officer. There is no voice transmission. Instead, commucations is accomplished using a code to modulate the transmitter's frequency (FSK). The Very low frequencies used allowed underwater communications. 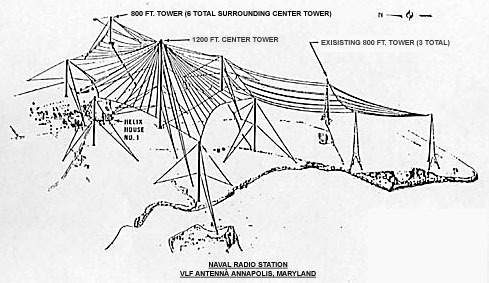 The original construction of the Annapolis Radio Station, which became NSS. 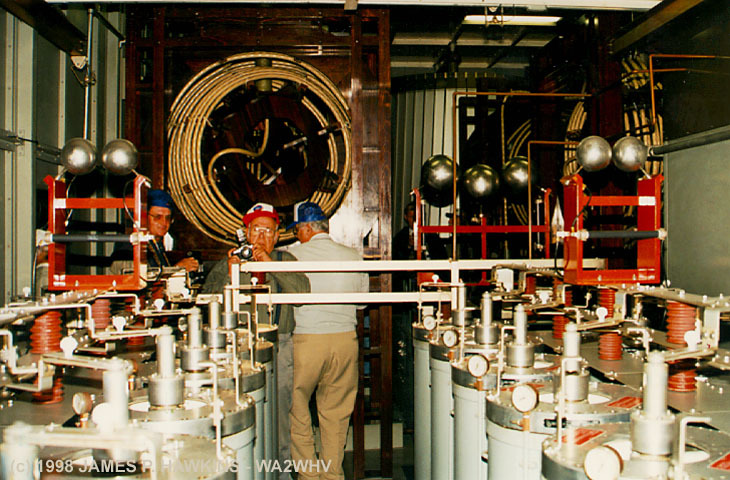 It consists of photographs of the Poulsen Arc transmitters in 1918 and other apparatus. The photos are very clear, having been scanned from the original large negatives. Construction of one of the towers is also shown. 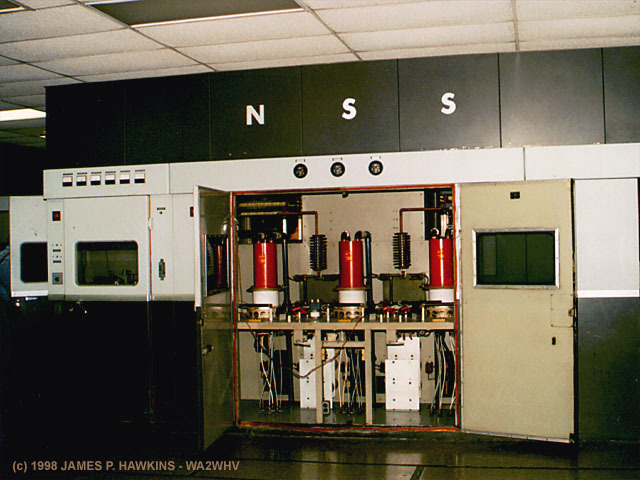 I'd like to thank Steve Ickes - WB3HUZ, webmaster/designer of the AM Window website, without which I would never have known about the NSS tour. Be sure to visit his site, it's well worth it! Thanks to John Cummings - N3CZE, who coordinated the tour, Bill Smith - N3SZW, for supplying directions to the site, Bob Koonce - W3GOU (former supervisor of communications at NSS) for an excellent presentation of the transmitter operation at the beginning of the tour. John Short, antenna expert at NSS; Craig Shuck; and Norm Chipps - N3RZU, AMer, vintage and military radio enthusiast. If I've left anyone out, mispelled any names or if anyone knows the names of all the tourguides and their function at the station please send me e-mail, so I can acknowledge them for their efforts on the tour and service at this facility. If it's YOU, please don't be shy, toot your horn. :-) Also, please feel free to send me mail on information you may feel is inaccurate or important additional information that may be worth mentioning. I do have other photos, but server space is running short. purposes including their distribution on CD-ROM or any other media without my permission is prohibited. the signal used by the transmitter. passes directly to the console at the millivolt level. This text was derived from the presentation given by Bob Koonce. The Continental Electronics AN/FRT-87 One Megawatt VLF transmitter consists of two separate power amplifiers and two intermediate amplifiers or driver units. In normal operation, both PAs are used, but only one driver is used at any given time. PA voltage is normally 18KV. The combined output of the to PAs together was 830KW. 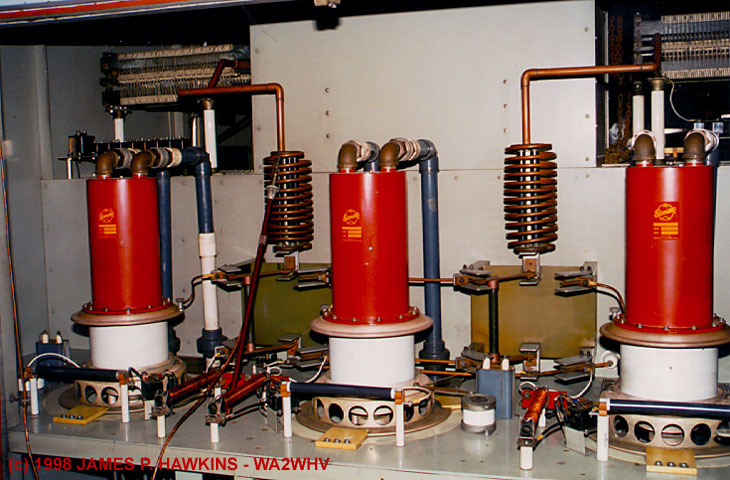 Each amplifier was capable of 550KW, power was lost in the summing of the two. 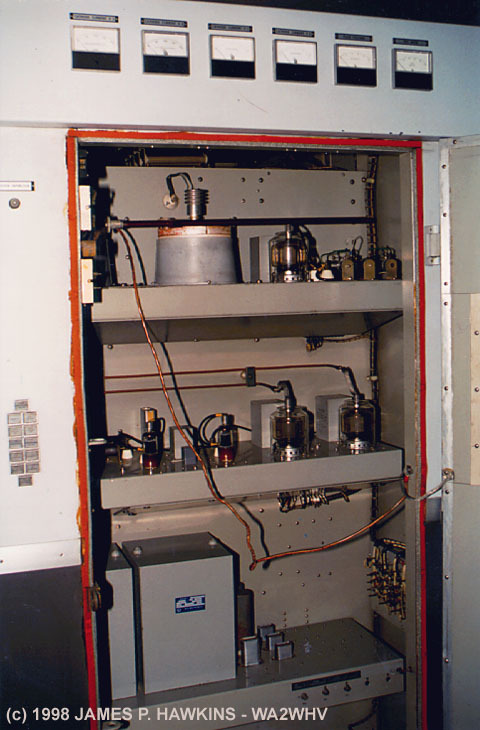 PA tubes were direct contact, water cooled tetrodes (type unknown). 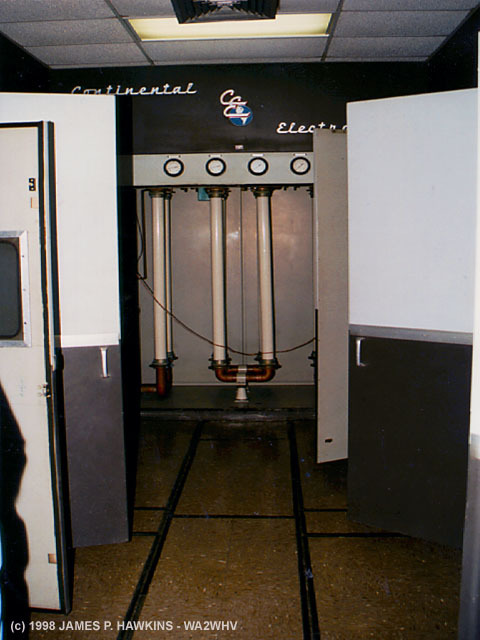 The radiated output was 30KW. The panels on the console are organized in a fashion that follows the amplification stages from left to right and allows tuning, monitoring and control of these stages. The IPA (Intermediate Power Amplifier) controls are on the far left. 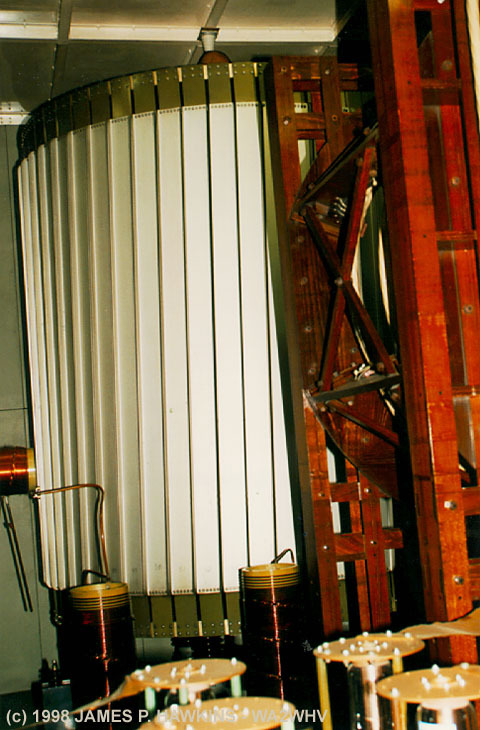 The signal is run through three stages of amplification, the final stage consisting of two 4CX15000 power tubes in a push-pull AB2 configuration. 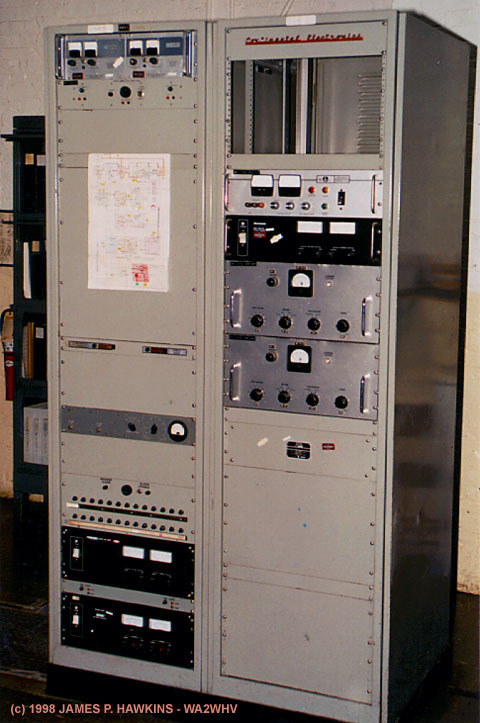 The output of the IPA was between 1200-1300 watts, which would drive the two final amplifiers. Tune-up was accomplished one amplifier at a time. After each amplifier was tuned individually, the outputs were "married" together in parallel. So, you have two power amplifiers, whose outputs are in parallel and whose inputs are driven by one, common IPA. Each PA contained three tubes. Two were in use at any given time with the third being a "hot" standby. 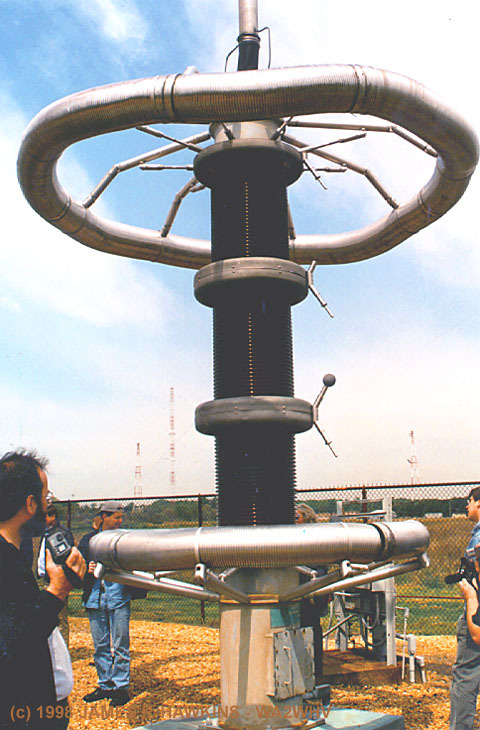 The output of the amplifiers would pass through a network of capacitors and variable inductors (variometers) to a gigantic toroid (a tall configuration with metal slats around it). The toroid ties the output of the two amplifiers together in parallel into the transformer primary. 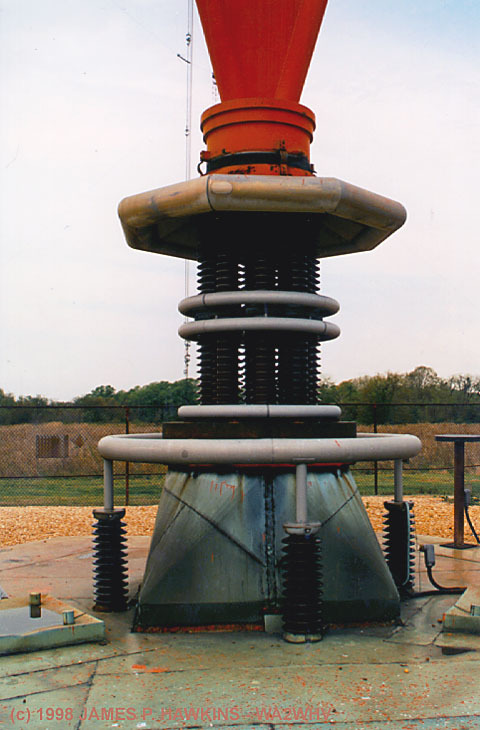 Through the center of the toroid runs a single "litz" cable, which acts as the transformer secondary. The cable then passes into and up through the roof of the "Helix house." From the top of the helix house, three feedlines pass to a quarter wave Marconi (vertical) antenna. That is, it's supposed to be! But at 21.4 KHZ, the wavelength is about 8 miles! The actual tower, of course is only 1200 feet. So, to make the antenna appear to be the correct length to the transmitter, a huge capacity top hat is employed. This technique was copied from the Russians (see note). 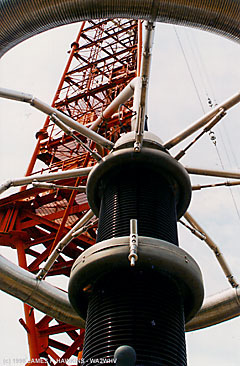 The antenna that this was copied from is called the Goliath antenna. So the overall antenna at NSS is called a Modified Goliath Antenna. 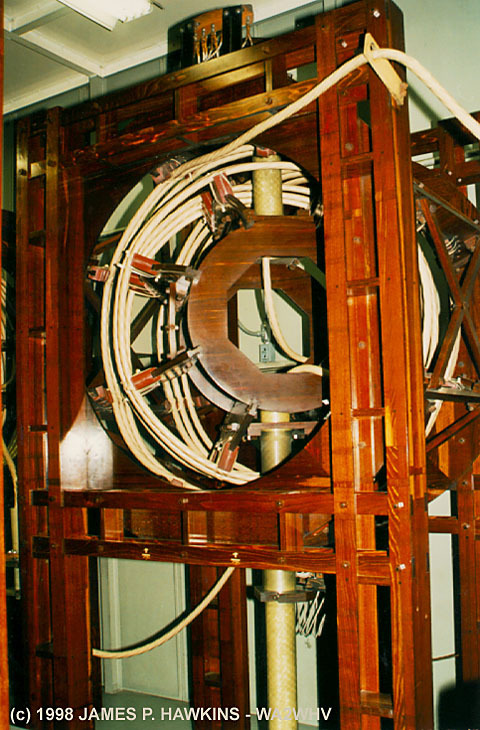 The top hat (a radial of cables) weighs as much as a destroyer, according to Bob Koonce. With the three feedlines, the feed impedance to the antenna is 0.1 ohms! The feed going out to the antenna is actually part of the antenna! So, when you tune the variometer, you are actually tuning the antenna itself. Typical tunup time was 20 minutes. Tuning the amplifier was a complex procedure to get the individual amplifiers to put out the same power in "mark" or "space" mode. Bob Koonce explained this in great detail and for now, I won't include it all here. (I have it on tape. Do you really think I could have remembered it? :-) One notable thing was that during high wind conditions, with the antenna system being the exremely high Q that it was, operators would have to sit in front of the controls and continually trim as the system changed. I'm sure that if this system were designed today, this would be computer monitored and controlled. The power coming into the antenna to supply everything with power is 2 megawatts. The two power amplifiers together use a bit over 1 megawatt as input. The output of each power amplifier individually is about 550KW. When the outputs of the two amplifiers are combinied at the toroid, the resulting power to the feed is about 830 KW. After passing through all of the antenna network components, the radiated output of the antenna is 30KW! That's a loss of 970 KW from power input to radiated power. There was no heating system in the building. All the necessary heat was provided by heat lost from the transmitter. 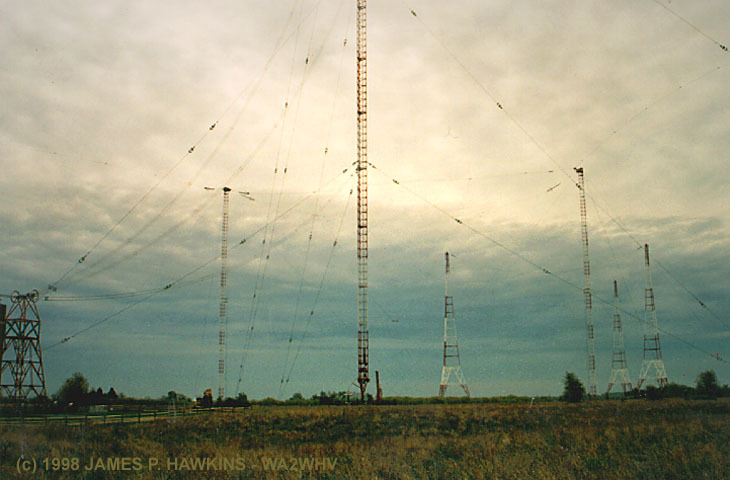 The mode of transmission was FSK (Frequency Shift Keying) at 25HZ at a rate of no more than 50 baud. 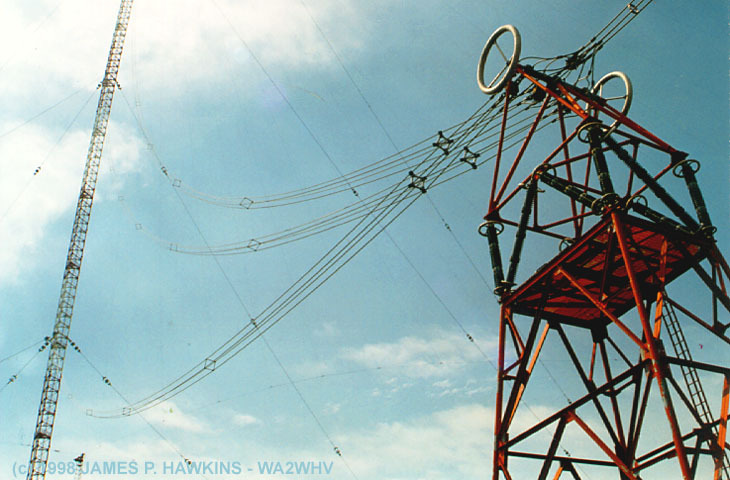 If the FSK exceeded 50 baud, the insulators at the end of the top hat would arc because of the extremely high Q of the antenna (the bandwidth extended too far beyond the point of peak tuning). 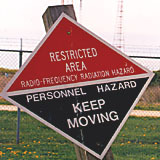 The RF environment in the area of the antennas was extremely dense at all times as this sign in back of the Helix house warns. made out of galvanized steel! 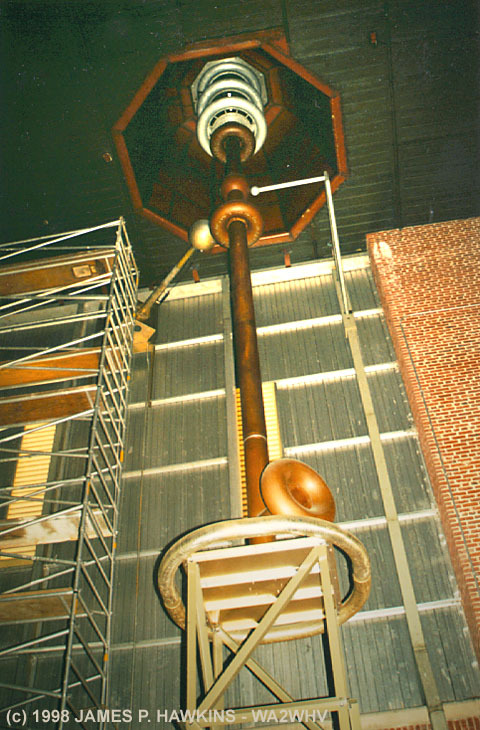 A full description of this antenna is contained in VLF Engineering, by Watt. The front of the transmitter has a 'U' configuration which spans across the entire control room. Between the two PA panels is an aisle accessing other components of the transmitter on either side. At the far end of the aisle is a control panel for the water cooling system. On both left and right extreme ends, the cabinet doors open up to long aisles on either side of what is a huge tuned circuit beginning with an aggrigate of capacitors, then huge, wood framed, tunable inductors called variometers. The output is combined in parallel into an enormouse toroid at the end of the chamber. A single heavy cable runs up through the toroid as the secondary which leads out to another very large room (Helix room) eventually to a feed out of the top of the building to the rest of the antenna system. There is no transmission line. The antenna system begins at the toroid, there is, therefore, no SWR! Open cabinet of intermediate amplifier. Three Eimac tetrode PA tubes. a total of four at full power. parellel. It reminds me of Madison Square Garden. is made up of over 100,000 insulated strands of fine wire. of partof the NSS antenna farm. 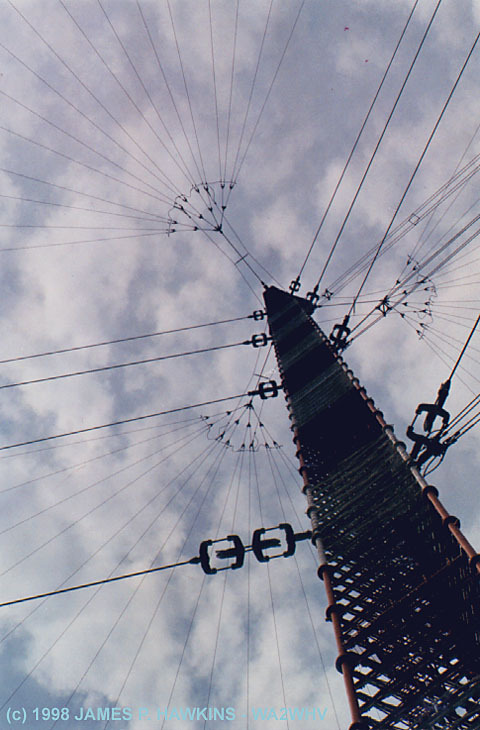 The central tower is surrounded by six 800' towers which support the capacity top hat. There is actually an elevator inside the main tower which stopped operating in 1995 and has never been repaired. There were other towers called "Eiffel" towers which were built in 1936 and are no longer in use. What in the world is that thing anyway? find one on every tower which is energized with RF. particular model is Serial Number 001.
be sure to visit Tesla Science Center page. 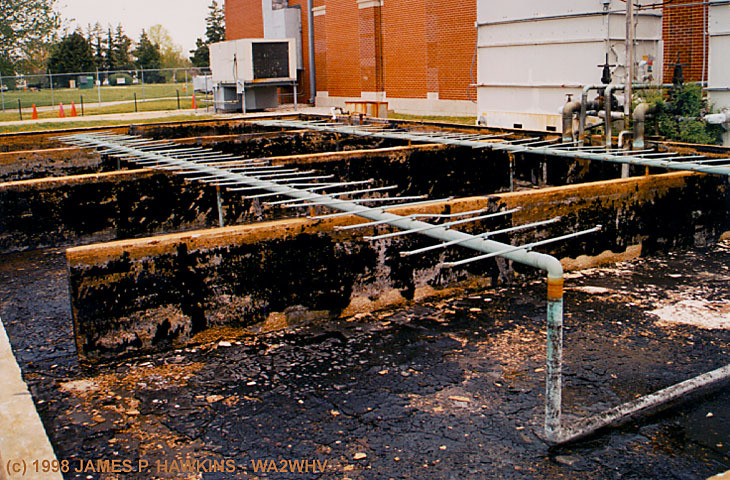 Drained water cooling pond with sprinklers. Water was cooled by spraying it into the air. strands almost as fine as steel wool! 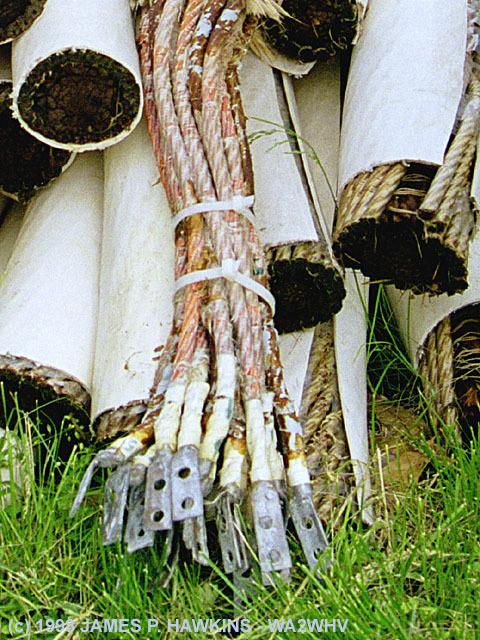 The litz cable, used throughout the NSS antenna system and in the variometers is made in Germany and consists of over 100,000 insulated copper strands surrounding a hemp core. This made the wire appear electrically longer in wavelength and increased the conductive surface area. The term "Litz," is derived from the German word "Litzendraht." In a German-English dictionary: Litze is defined as lace, cord, braid; Draht is defined as telegraph, wire. It describes a conductor consisting of a number of separately insulated strands that are twisted or braided together. 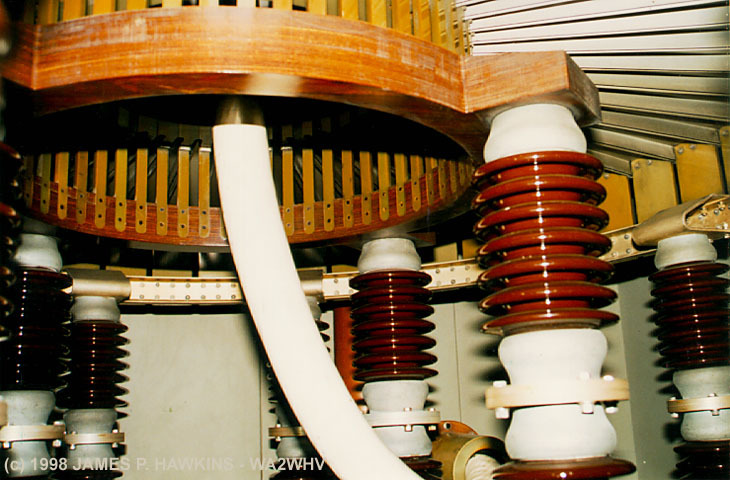 The litz design equalizes the flux linkages and reactances of the individual strands causing the current to spread uniformly throughout the conductor, because each strand tends to take all possible positions in the cross section of the entire conductor. The A.C. to D.C. resistance ratio then tends to approach unity which makes this design very desirable in high Q circuit applications. Some of the above info was found at the New England Electric Wire Technologies Website. This was the "daisy chain" probably of paper tape for continuous Morse keying without a human operator when the operator had no message to send or needed a restroom break between messages. The "V" sequence was just an attention grabber. "DE" = "from" and "NSS" is the call sign. 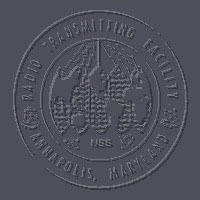 I suppose simply turning the transmitter off was not an option since the transmitter may have been needed by ships for DF [Direction Finding] (later by submarines for rho-rho2 location as well). In modern times, the US Navy transmits messages using a cypher which makes the bit string indistinguishable, statistically, from white noise. When there is no message to be sent, a non-repetitive dummy "message" is sent which is also white noise. This is to prevent (or make difficult!) code breaking. Thus nothing like a "daisy chain" is transmitted any more since it would provide a little bit of info to code breakers. 2) rho is the Greek letter equivalent to English r. It stands for "range". US Navy VLF transmitters and submarines use cesium beam frequency standards which are so precise that submarines can measure their velocity and so distance (range) from any such transmitter. Having 2 such ranges (rho-rho) is sufficient to give a position (there's an ambiguity but the submarine easily resolves that). Brian, W9IND, tipped me off about this video on YouTube, so I embedded it here. Radio Station Grimeton. 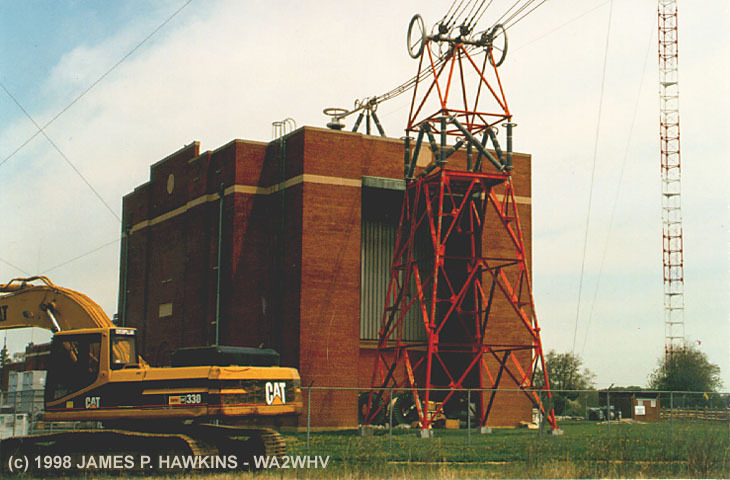 VLF station transmits with AC generator! Accessed times since April 22, 1998.